TOKYO — Indonesia’s growing middle class and its fondness for Western food has prompted Japanese food company Nisshin Oillio Group to start producing chocolate in the country. Daito Cacao, a unit of Nisshin Oillio, embarked on a joint venture in February with Salim Ivomas Pratama, a cacao plantation unit of Indonesian conglomerate Salim Group. Daito Cacao will put 51% of the $32 million total investment. The joint company will build a plant on a roughly 20,000-sq.-meter plot in Purwakarta, about 65km from Jakarta. Construction is set to begin as early as this autumn. The plant will start operating by 2019 with an initial annual output of 4,000 to 5,000 tons, which the company hopes to raise to 10,000 tons in the future. Daito Cacao hopes to leverage its strengths — which include heat-resistant chocolate production technology — to boost sales in tropical Southeast Asia. According to British market research company Euromonitor International, Indonesia’s chocolate consumption reached about 70,000 tons in 2015. This is expected to increase to 83,000 tons by 2020 — much faster growth than in Japan, Europe or the U.S. Many in this former Dutch colony make chocolate at home. With a growing population of 250 million and a burgeoning middle class, demand is expected to increase even further. 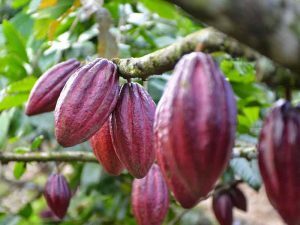 Daito Cacao will dip into Nisshin Oillio Group’s supply chain in Southeast Asia for ingredients. Sugar and dairy products will come from T&C Manufacturing, Daito Cacao’s Singapore unit, and fats from Intercontinental Specialty Fats, Nisshin Oillio’s Malaysian unit. Initially, the finished chocolate will be sold to food producers owned by Salim Group. “We want to export our products to Thailand, the Philippines and other Southeast Asian countries,” said Daito Cacao President Shigeyuki Takeuchi. That said, Indonesia’s small retailers are mainly food stalls and movable kiosks that are not sufficiently refrigerated. To further expand the chocolate market, improving refrigerated delivery systems will be necessary.